Amazon.com description: Product Description: The Pyramid Texts are the oldest body of extant literature from ancient Egypt. First carved on the walls of the burial chambers in the pyramids of kings and queens of the Old Kingdom, they provide the earliest comprehensive view of the way in which the ancient Egyptians understood the structure of the universe, the role of the gods, and the fate of human beings after death. Their importance lies in their antiquity and in their endurance throughout the entire intellectual history of ancient Egypt. This volume contains the complete translation of the Pyramid Texts, including new texts recently discovered and published. It incorporates full restorations and readings indicated by post-Old Kingdom copies of the texts and is the first translation that presents the texts in the order in which they were meant to be read in each of the original sources. 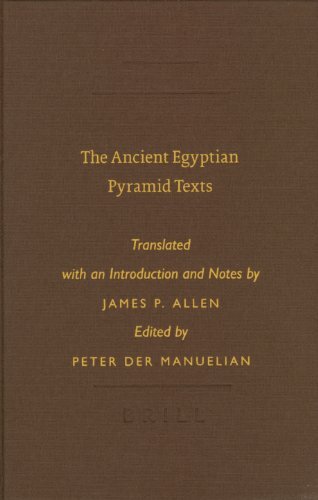 "Paperback edition is available from the Society of Biblical Literature (www.sbl-site.org)"
About: Completely revised and updated James P.
About: The Pyramid Texts are the oldest body of extant literature from ancient Egypt.